The simulation takes viewers into the black hole at the center of our galaxy. Finally, modern technology has made it possible for us to live out our childhood dreams and dive head-first into a black hole. Or, at the very least, a new 360-degree video lets us see what it would look like before the incredible gravitational pull tore us to shreds. 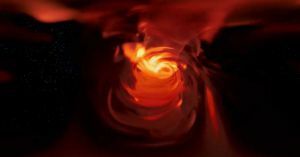 A team of physicists out of Radboud University in The Netherlands and the Institute for Theoretical Physics in Germany created an immersive video that accurately simulates Sagittarius A*, the black hole that’s slowly eating the Milky Way from the inside out. The researchers hope the simulation, published Monday in the journal Computational Astrophysics and Cosmology, will help educate people of all ages about how black holes really work. As the video shows, black holes like Sagittarius A* are dynamic hubs of cosmic activity, not silent spheres of nothingness that sit around and occasionally gulp down a wayward star or planet. In the video, which can be watched with or without a virtual reality headset, the audience is dragged along by Sagittarius A*’s gravitational pull. It brings people closer and closer to the black hole, which rests in the middle of what looks like a gigantic, fiery tornado. But there’s no “if you die in the Matrix, you die in real life” moment here — before the audience is plunged into the black hole, the audience is catapulted backward, rocketing away until Sagittarius A* fades from their view altogether.